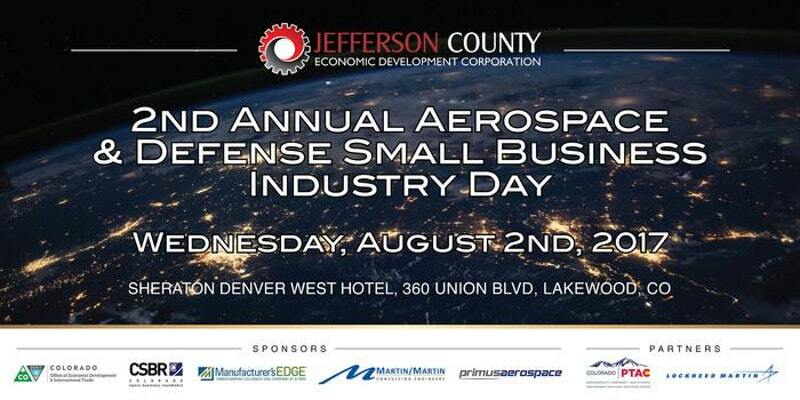 July 12, 2017 – The Jefferson County Economic Development Corporation in partnership with Lockheed Martin and the Procurement Technical Assistance Center (PTAC) are proud to once again present the Aerospace and Defense Small Business Industry Day with a welcome address from Colorado Lt. Governor Donna Lynne on Aug. 2, 8 a.m. – 4 p.m. at the Sheraton Denver West Hotel in Lakewood. Businesses, especially disadvantaged businesses, veteran-owned businesses, minority and women-owned businesses, and HUBZone firms, interested in working with aerospace prime contractors and/or the federal government should plan to attend this event. Registration is online. The event will include informational sessions on the Colorado aerospace industry and related business topics, networking opportunities, and matchmaking with prime contractors for small businesses. Attendees will have the opportunity to engage with large industry companies, government procurement personnel and small business assistance organizations such as the Colorado Minority Business Office and the Small Business Development Center (SBDC) network. Companies such as Lockheed Martin, Honeywell, Teledyne Brown, Sierra Nevada, United Launch Alliance, Jacobs Engineering, PTAC, SBA, U.S Air Force will have representatives at the event available to answer specific questions about doing business with their respective organizations. Gus Hernandez, owner and founder of DynAeroTech, plans to attend the event for a second time and encourages other small businesses to attend the event as well. By attending the event last year, Hernandez was able to build his business through various resources available at the event and creating partnerships with other small businesses. “We highly recommend attendance to this event for any small business,” Hernandez added. Jefferson County is home to some of the world’s most successful and diverse companies that are creating world-class technologies and products including Lockheed Martin, MillerCoors, Terumo BCT, Ball Corporation and Pilatus Business Aircraft.